Our guides have been designed to provide the most complete and upto-date information available. Current and entertaining, they have been professionally produced with a class-leading design that provides a rich and informative pretext to your new life in Spain, whether you are coming here to live on the Costa Blanca, enjoy a holiday home in Spain, or retire on the Orihuela Costa. Our selection of Costa Blanca property guides are promoted throughout Northern Europe both on our website and via Social Media, and they are an important tool in our marketing toolbox. They allow us to showcase our clients properties for sale in new and exciting ways that other local estate agents in La Zenia just cannot match. Just one of the unique ways that we go the extra mile to sell our clients properties in Spain. For our prospective property buyers, they give a personal insight in to the Spanish lifestyle, the property market in Spain, and with news and features, they are both a rich research resource for fledgling Spanish property owners and entertaining too. 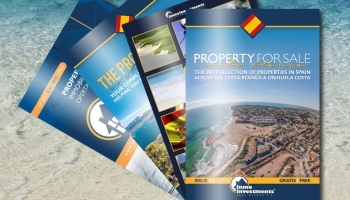 Available for free download to your smartphone, tablet, or your laptop, or view our Spanish property guides online on our Issuu publishers channel. Remember to sign up to our newsletter to receive notification of new guides as soon as they are released. Just enter your email address in the box at the bottom of this page.